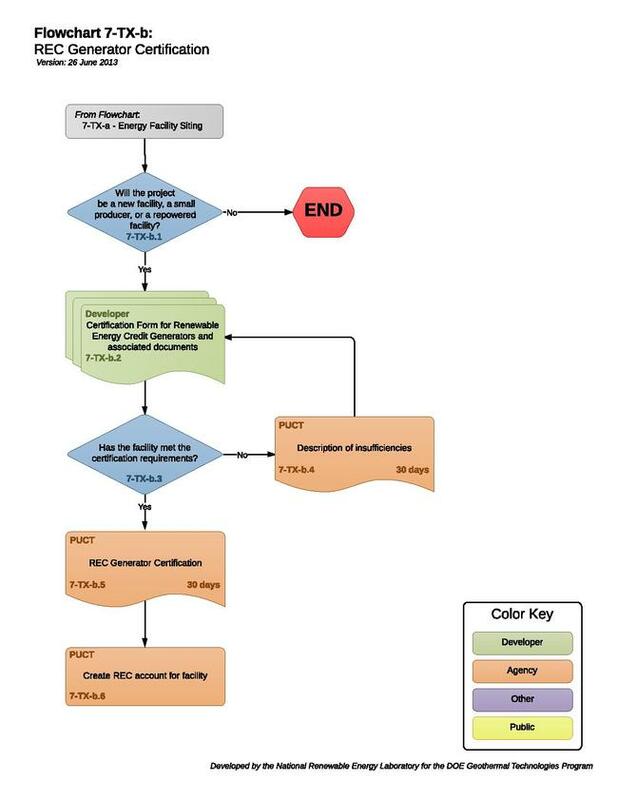 This flowchart illustrates the application and approval process for participating in the Renewable Energy Credit program in Texas. A renewable energy credits trading program was established to ensure that an additional 2,000 MW of new renewable energy capacity will be built in Texas by 2009 and that customers have access to providers of energy generated by renewable energy resources. To earn Renewable Energy Credits (RECs), a generator must be a new facility or a small producer as defined in PUCT Substantive Rule 25.173(c) and must meet the requirements of 25.173. A power generating company may participate in the program and may generate RECs and buy or sell RECs. The Public Utility Commission of Texas appointed the Electric Reliability Council of Texas (ERCOT) as the program administrator of the REC trading program. Entities participating in the REC trading program must register with and execute the appropriate agreements with ERCOT. This applies to facilities in ERCOT areas and facilities outside ERCOT areas. Facilities must be approved by the PUCT as a REC Generator before a REC Account is established. 7-TX-b.1 - Will the Project Be a New Facility, a Small Producer, or a Repowered Facility? To earn RECs, a generator must be a new facility, a small producer, or a repowered facility. "New facility" means renewable energy generators placed in service on or after September 1, 1999. A new facility includes the incremental capacity and associated energy from an existing renewable facility achieved through repowering activities undertaken on or after September 1, 1999. "Small producer" means a renewable resource that is less than ten megawatts (MW) in size. "Repowered facility" means an existing facility that has been modernized or upgraded to use renewable energy technology. The PUCT must certify all renewable facilities that will produce either REC offsets, RECs, or compliance premiums for sale in the trading program. To be awarded RECs, or REC offsets, or compliance premiums, a power generator must complete the certification process described in this subsection. The program administrator shall not award offsets, RECs, or compliance premiums for energy produced by a power generator before it has been certified by the commission. The output of the facility must be readily capable of being physically metered and verified in Texas by the program administrator. PUCT Substantive Rule 25.173. 1. A completed Certification Form for Renewable Energy Credit Generators. 2. A map showing the location of the facility and, if applicable, its boundary (for example, the boundary of the wind farm area metered at the point specified in Item 10). The map must also show the facility’s interconnection point(s) with the local distribution or transmission system, and the location of all generation units listed under Item 13 of the application. 3. If one or more of the metering points are not part of the transmission or distribution system of ERCOT, an Independent System Operator, a Regional Transmission Organization, or an Independent Organization as defined in PURA Section 39.151(b), a narrative explaining where and how the output of the facility may be physically metered and verified in Texas by the Program Administrator. 7-TX-b.3 - Has the Facility Met the Certification Requirements? No later than 30 days after the designated representative files the certification form with the commission, the PUCT must inform both the REC program administrator and the facility's designated representative whether the renewable facility has met the certification requirements. PUCT Substantive Rule 25.173. The commission will either certify the renewable facility as eligible to receive RECs, offsets, or compliance premiums, or describe any insufficiencies to be remedied. If the application is contested, the time for acting will be extended for such time as is necessary for commission action. PUCT Substantive Rule 25.173. The PUCT will issue a REC Generator Certificate. Upon receiving notice of certification of new facilities, the program administrator will create a REC account for the designated representative of the renewable resource. The PUCT or program administrator may make on-site visits to any certified facility, and the PUCT may decertify any facility if it is not in compliance with the provisions of this section. PUCT Substantive Rule 25.173. This page was last modified on 24 September 2015, at 16:07.